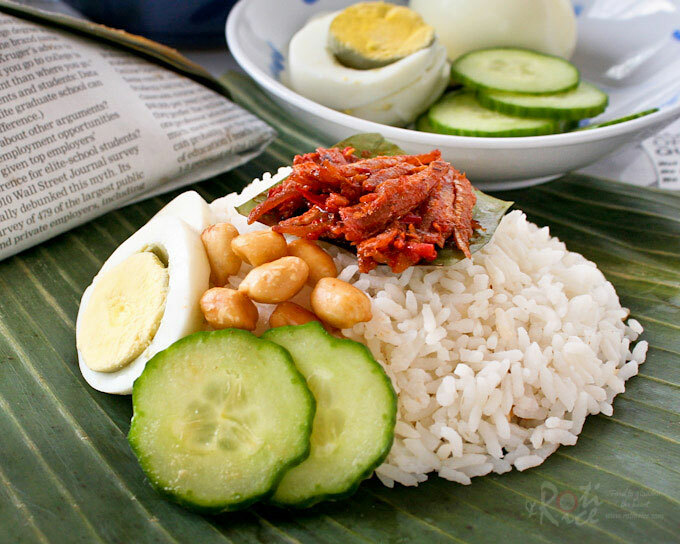 Every Malaysian and anyone who has ever lived in Malaysia for a period of time would know about Nasi Lemak. This ever popular and ubiquitous dish can be found at the humblest street corner stands to the poshest hotel restaurants. In the old days, one does not have to look far to get a taste of this dish. Vendors came round with baskets filled with little pyramid shaped packets of Nasi Lemak wrapped in banana leaves and newsprint during ball games and public events. Yet, it is still cooked at home for picnics, parties, and regular meals. Malaysians love their nasi lemak and can’t leave home without it. It is as popular abroad as it is in the homeland. You will likely find this dish in a gathering of homesick Malaysians and it is offered in every Malaysian restaurant I have encountered overseas. One can indeed say that Nasi Lemak is the de facto national dish of Malaysia. 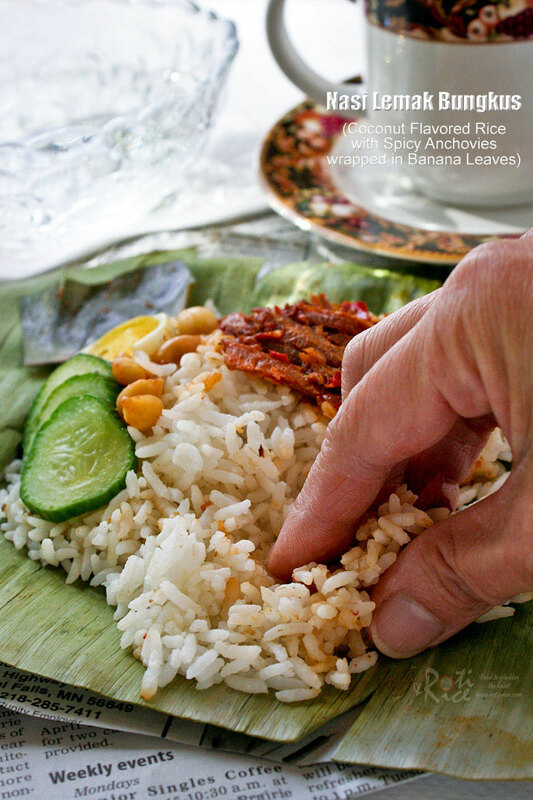 Nasi Lemak means creamy rice. The rice is cooked in coconut milk infused with pandan leaves. A little ginger is sometimes added. The most basic accompaniments to this rice are sambal ikan bilis (spicy anchovies), hard boiled egg, slices of cucumber, and peanuts. Other popular add-ons include Chicken Curry, Beef Rendang (dry beef curry), sambal sotong (spicy squid), and acar (spicy vegetable salad). 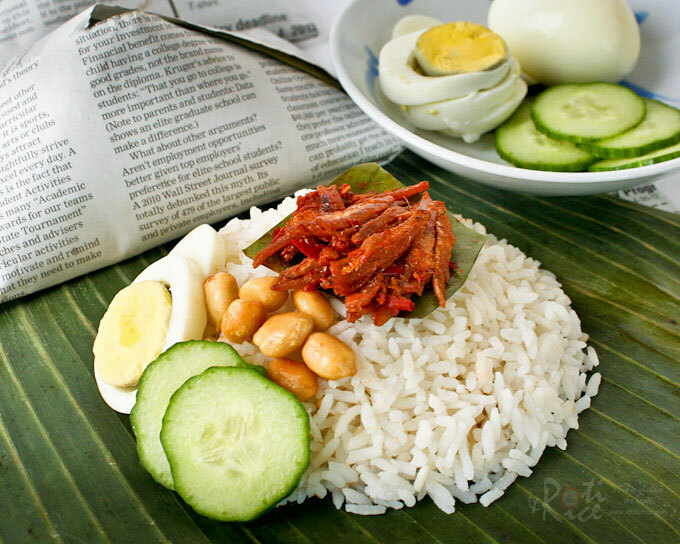 Traditionally, Nasi Lemak is wrapped in newsprint lined with banana leaves. The banana leaves enhances the dish as it imparts a light fragrance to the rice when wrapped warm and allowed to sit for a short period of time. Nasi lemak wrapped in banana leaves are becoming scarcer as more and more vendors use waxed paper. Restaurants normally serve them on plates. I do eat my fair share of Nasi Lemak whenever I visit my parents in Malaysia. 😀 These pictures were taken in the summer of 2010. I also ate lots of Nasi Lemak Bungkus but unfortunately I did not take a picture of the pyramid shaped packages which I must remember to do so the next time I visit. 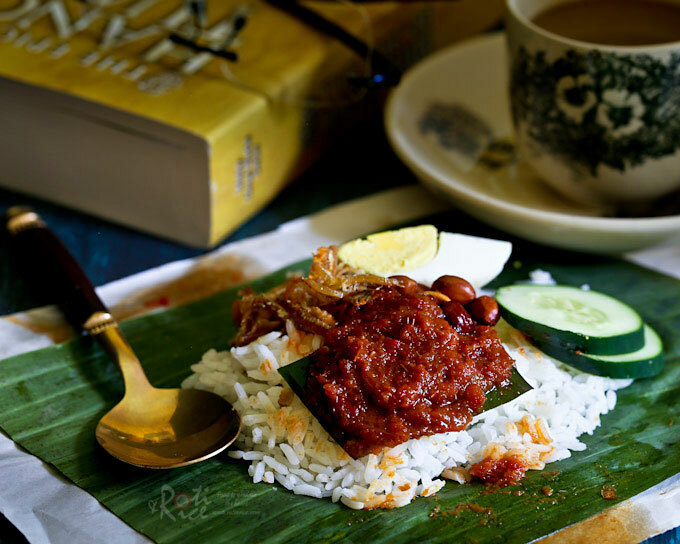 The quintessential Malaysian breakfast is Nasi Lemak Bungkus accompanied by a cup of sweet kopi-o. When ordering coffee in Malaysia kopi-o means coffee with sugar only. If you just say “kopi”, it will come sweetened with condensed milk. By adding the words “kurang manis”, you will get it less sweet. For black coffee, say “kopi kosong” which is like zero coffee with no sugar and no milk. For iced coffee, say “kopi peng”. Malaysian coffee is strong coffee. For some it is an acquired taste. The beans are roasted with butter or margarine and sugar, giving it a slightly burnt smell. 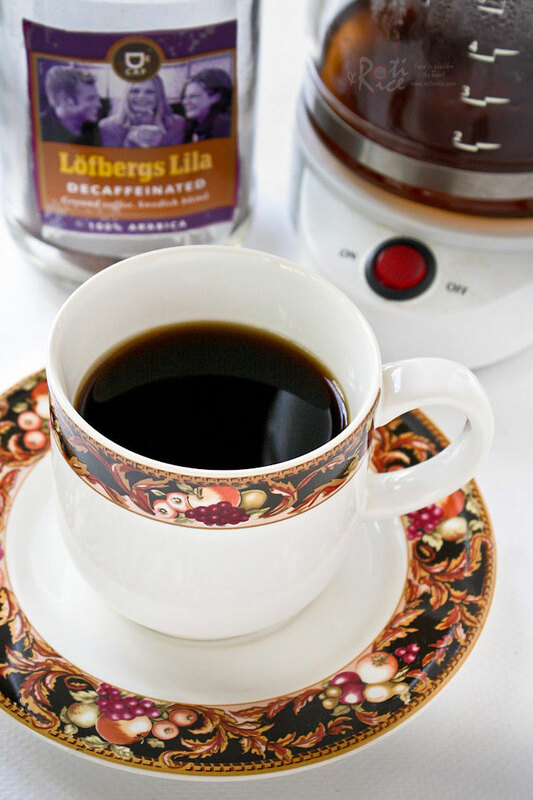 Coffee is made by pouring boiling water through ground coffee held in a cloth sock filter in a koleh or enamel mug. This resulting brew is thick, strong, and bitter. It can be drunk hot or iced. Do give it a try if you get a chance to visit. Don’t be surprise if you see someone doing this in the warong (Malay eatery) or Indian stall. Some Baba Nyonyas do eat with their fingers too but usually only at home. Always use your right hand even if you are left-handed. Food should never go above one’s knuckles. If other dishes are served together in a meal, use your clean left hand to take food with the serving spoon provided. Do clean both hands with the bowl or flask of water set on the table specifically for that purpose before and after the meal. I have known of visitors to Malaysia who have unwittingly drank from the hand washing bowl much to the consternation of the host! Wash and drain rice 4 to 5 times in rice cooker insert. Cover washed rice with water and allow it to soak together with knotted pandan leaves for 20 minutes. Drain rice and dry exterior of rice cooker insert. Add pandan leaves, ginger, and salt. Pour in coconut milk. It should come up to about the 2¾ cups level. Place insert into rice cooker and press the start button. When rice is cooked, unplug the rice cooker and allow rice to sit for 10 minutes. Fluff rice with a pair of chopsticks or a fork before serving. Wash and drain rice 4 to 5 times in rice cooker insert. Cover washed rice with water and allow it to soak together with knotted pandan leaves for 20 minutes. Drain rice and add pandan leaves, ginger, and salt. Pour in coconut milk. Place pot on the stove over medium heat. When coconut milk comes to a boil, reduce heat to medium low and allow rice to cook until all coconut milk is absorbed. This will take about 10 minutes. Turn heat down to the lowest possible setting and continue to cook for another 5 minutes. Turn off heat. Let rice sit for 10 minutes before fluffing rice with a pair of chopsticks or a fork before serving. Break dried chilies in half and shake off seeds. Soak in warm water for 15 minutes. Wash and soak ikan bilis separately for 15 minutes. Drain and blot dry with paper towels. Blend all spice paste ingredients until fine, adding a tablespoon of water if needed. Remove and set aside. Heat oil in a medium sized pan. Add ikan bilis and fry till golden brown, about 7 to 8 minutes. Remove and set aside. Add remaining tablespoon of oil and spice paste in the same pan. Fry spice paste until fragrant, about 3 to 5 minutes. Mix tamarind paste and water in a small bowl. Pour into pan and stir to get spices and tamarind juice well mixed. When it comes to a boil, add sugar and salt. Finally, return fried ikan bilis** to the pan and cook for 2 to 3 more minutes. Remove. Place a bowl of rice on plate with half and egg, a few slices of cucumber, some peanuts, and sambal ikan bilis pile on top of rice. 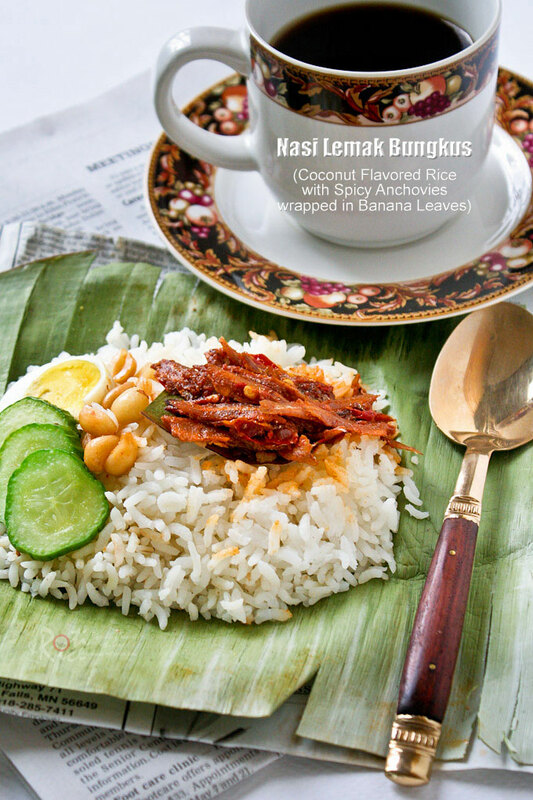 Alternatively, place warm nasi lemak portion on a piece of newsprint lined with banana leaf. Banana leaf should be slightly longer but narrower than newsprint. Bring both long edges of banana leaf and newsprint to meet in the center with the one edge overlapping slightly on one end. Criss-cross the flaps in the center by placing bottom flap on the top on the opposite end. Fold both ends under to form a pyramid shape package. **Alternatively, fried ikan bilis can be separate from the sambal. This time I decided not to add the fried ikan bilis (anchovies) to the sambal so that it will remain crispy. You can do it either way. It will be just as delicious. I also took this opportunity to add the step-by-step pictures for wrapping the Nasi Lemak Bungkus which was not there previously. Hopefully, you will find it useful. Looks delicious! Those anchovies look particularly interesting! I have to try it! Yes, do give it a try Pola. I hope you like it. Gert, I’ll give you dua bungkus. Satu bungkus tak cukup. ;). Yes, I know the one at Jalan 222. There is also a delicious nasi kandar stall there. Nice dish – this is new to me. The ikan bilis look really attractive (great color! 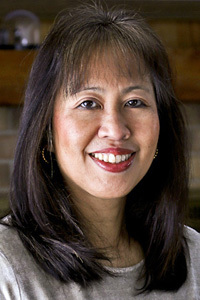 ), and the sambal sounds delicious. Nice combo of flavors. Thanks for this. Wah! 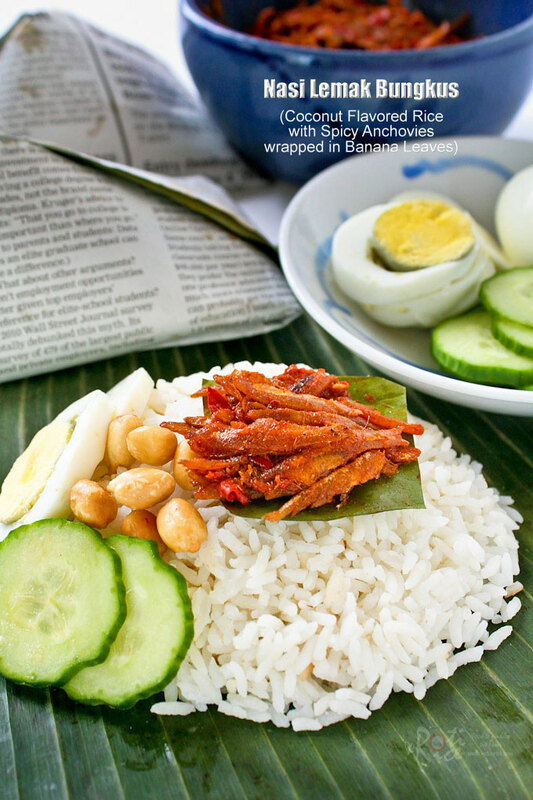 Your nasi lemak looks so good, I’m surprised this came out of a kitchen in Minnesota 😉 My mum’s favourite breakfast is nasi lemak and kopi-o and the newspaper bungkus reminds me of the nasi lemak aunty in my primary school canteen – 30 cents a packet!! Now I feel like cooking nasi lemak tomorrow. It will be wonderful with the kalio ayam leftover from today’s dinner! Btw – do I see serundeng and chicken curry on one of those nasi lemak plates? Those were the days. I think we only paid 10 cents or 20 cents per packet in primary school. Sometimes, someone’s mom would bring a basket with all these nasi lemak bungkus but they were so popular that you can’t even get close to it unless you have “jalan”. You know what I mean? I can’t remember if that was serunding or sambal hae bee. That little plate on the top left was acar. That nasi lemak was from Madam Kwan in KLCC. Used to be known as Sakura and they are famous for their nasi lemak. Prices have gone up so much and that plate cost a whopping RM20.00! BTW, what is kalio ayam? It probably has a different name in Malaysia. Wah, sounds really delish! Your neighbors must be salivating all the time with all the wonderful aromas coming out of your kitchen. Wow …love the detail of the recipe and the photographs are mind blowing!! I hope you get to visit one day and try all the delicious food you have been seeing and reading on the Malaysian food blogs. Wow…fresh banana leaves! I buy mine frozen from the Asian grocery stores. Try the Vietnamese shops for pandan. They are known as “la dua” in Vietnamese and are usually found in the frozen section. P.s. Thanks for sharing it on RecipeNewZ! Dua bungkus nasi lemak for me please…my all time favourite! Rice with fried anchovies and egg is a favorite breakfast in the Philippines and I find it really good! But this one sounds even better! Rice cooked in coconut milk tastes wonderful for sure! And the spicy anchovies makes this more appetizing! I love the sound of wrapping food in banana leaves..it looks just amazing, Biran! Indeed, nasi lemak is one nostalgic food, almost a signature dish of Malaysia. Love it 😀 You’re a great ambassador to the local foods of M’sia, Biren! Banana leaves, newsprints, eating with the fingers, and all the kopi’s. LOL! There’s another “kopi” as well. The “kopi-C” or “kopi sii” with sugar and evaporated milk. “Kopi-C peng” will be iced coffee with suga and evaporated milk. I love coconut rice, but I guess I’ve never had the real thing. You recipe and method sound wonderful! 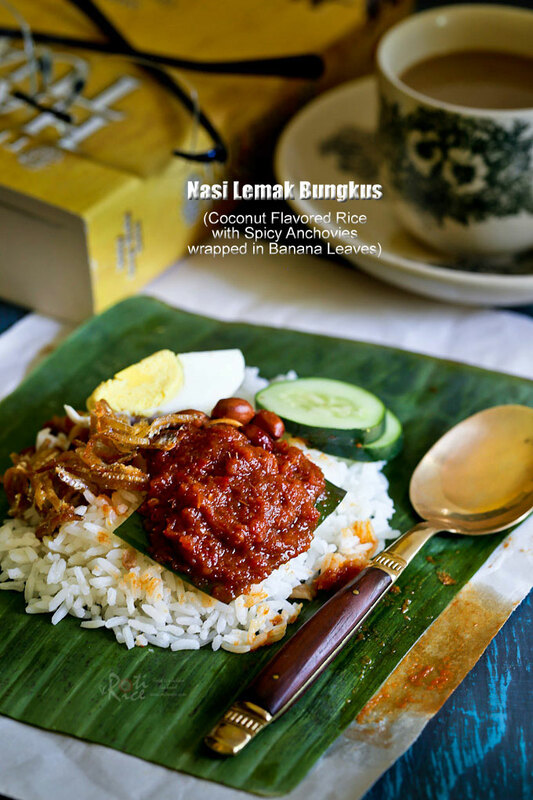 This Nasi Lemak sounds delicious. I’ve only had a couple of dishes wrapped in a banana leaf but never anything like this. Thanks for sharing this traditional dish! That’s why I love coming here – always interesting and new foods! I spent a summer in Malaysia and miss the food so much! Especially because there are no restaurants in Chicago! This will definitely be on my to cook list! Authentic! I love nasi lemak for the spicy anchovies lol! otherwise, you don’t see me eating it. Anchovies sambal is a must! Yes, the sambal ikan bilis is a must. Some styles are different with a sambal and then fried ikan bilis. That’s nice too but I like the sambal ikan bilis better because mom prepares it that way. That does look like a dish that is full of interesting flavours. Love how it’s served in a banana leaf. I miss this, I remember having this in Mamak in Malaysia. Its always on the centre table waiting to be opened by anyone who is tempted to. I learned about this dish immediately after I started blog hop. Ever since then I have been curious about this taste. Everyone in Malaysia loves this and talks highly of this… Got to visit Malaysia or probably closer to visit you Biren! :-). Wow, nice collection of nasi lemak pix! S’poreans are crazy over this too. In fact, I just had it for lunch. Hubby bought it from a popular stall named “Power Nasi Lemask”. Hahaha! What an innovative name! Lovely recipe, dear! WOW! You always have something so fantastic and unique up your sleeve. the anchovies with that spice and wrapped up in banana leaves? GENIUS and who doesn’t love a great flavored rich dish! Job well done! This looks so yummy! Love esp. those anchovies! Ooh I love nasi lemak! To me it’s the perfect blank canvas for adding all the yummy spicy add-ons. Ikan bilis is a must! That’s the bare minimum for me: ikan bilis, an egg, cucumbers, and loads of sambal! I like it with sambal telur (deep fried eggs) which I just wrote about too (: Or sambal udang (prawns). Or that fried fish! I’m getting carried away already. Oh Biren I’m so excited about learning new things about food from different cultures and countries, this is such an exotic recipe! I absolutely love nasi lemak. When I flew to Malaysia with MAS, I didn’t even hesitate to have nasi lemak for breakfast! I am not sure which part I did wrong but my sambal came out bitter. I followed your instructions step by step. The only thing I am not sure about is the tamarind sauce. None of the ingredients for the sambal are even remotely bitter unless you accidentally used a different ingredient. The tamarind is asam jawa. You can use either the paste or concentrate. If you use the paste, you will have to rinse, soak, and strain the juice. Here is a picture of both the concentrate and the paste –> Asam Jawa.